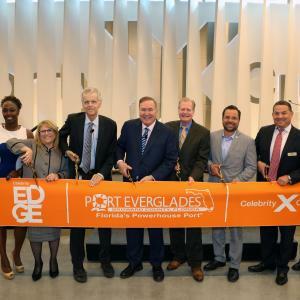 BROWARD COUNTY, FL -- Port Everglades and Celebrity Cruises enjoyed a double celebration with the arrival of the line’s first new ship class in a decade, Celebrity Edge, at her new home, the revolutionary Cruise Terminal 25 (T25). T25 underwent a complete renovation, requiring the demolition of two smaller terminals to expand the total square footage by 83 percent to 157,800 square feet. With a cost of approximately $120 million, the new facility is the largest financial investment Port Everglades has made in a cruise terminal. "When designing the revolutionary Celebrity Edge, we knew we wanted to design a terminal that perfectly complemented the ship and matched its one-of-a-kind experience," said Lisa Lutoff-Perlo, President and CEO, Celebrity Cruises. In addition to Celebrity Edge, T25 will be the new home to many Celebrity ships during their winter deployment, including Celebrity Infinity, Celebrity Reflection and Celebrity Silhouette. Along with these ships, the terminal will be able to accommodate other ships up to 1,150-foot-long. The building was designed for LEED certification by architectural firm Bermello Ajamil & Partners, Inc., with Moss Construction serving as the managing general contractor. The Port Everglades Seaport Engineering and Facilities Maintenance Division was integral in ensuring timely project delivery. New “expedited arrival” technology in T25 will make the check-in process seamless. The terminal is designed to be adaptive, featuring modern pod-style mobile check-in desks and is able to accommodate legacy technology. The “Visual Voyage” interactive artwork installation spans over 260 feet in the terminal check-in area as guests engage individually or in groups as they make the lights on this artwork travel along each of the 24 time zones of the global map. T25 also offers Suite Class guests a singular experience along the path to The Retreat, with an exclusive VIP lounge, elevator, separate security screening area, and even a private rooftop terrace. Celebrity Cruises&apos; iconic "X" is the mark of modern luxury, with its cool, contemporary design and warm spaces; dining experiences where the design of the venues is as important as the cuisine; and the amazing service that only Celebrity can provide, all created to provide an unmatchable experience for vacationers&apos; precious time. Celebrity Cruises&apos; 12 ships offer modern luxury vacations visiting all seven continents. Celebrity also presents incredible cruise tour experiences in Alaska and Canada. Celebrity is one of five cruise brands operated by global cruise vacation company Royal Caribbean Cruises Ltd. (NYSE: RCL). For more information, dial 1-800-437-3111, visit celebritycruises.com, or call your travel agent. Located in the second largest county in Florida, Broward County&apos;s Port Everglades is consistently ranked as one of the three busiest cruise ports in the world with approximately 3.87 million passengers in fiscal year 2018 (Oct. 1, 2017 through September 30, 2018). Ten cruise lines, one ferry service and nearly 40 cruise ships sail from the South Florida seaport including: Balearia&apos;s Bahamas Express (ferry), Carnival Cruise Line, Celebrity Cruises, Costa Cruises, Crystal Cruises, Cunard Line, Holland America Line, Pearl Seas Cruises, Princess Cruises, Royal Caribbean International, and Silversea Cruises. The Port&apos;s wide-ranging fleet of cruise ships provides guests with an array of cruise vacation choices from the Fort Lauderdale, Hollywood, and Dania Beach area. View details on the latest cruise offerings at porteverglades.net or contact us by emailing PortEverglades@broward.org. Cutting the ribbon are (from left): Dania Beach Mayor Tamara James, Celebrity Cruises’ President Lisa Lutoff-Perlo, Port Everglades Chief Executive & Port Director Steven Cernak, Royal Caribbean Cruise Ltd. Chairman and CEO Richard Fain, Broward County Commissioner Tim Ryan, Hollywood Mayor Josh Levy, Broward County Commissioner Michael Udine, and Fort Lauderdale Commissioner Steve Glassman.